Have you ever read the back of a packet of baking powder to check what is actually in it? Next to cornstarch and baking soda also referred to as E 500(ii) in Europe, you can find other raising agents. The one in a much used package in Europe was labelled E 450i. I looked it up in my E-numbers and additives book and I read that this ‘disodium diphosphate’ can have several side effects like slowing down your intake of calcium, hyper activeness in children and possible kidney damage. This for me was a first incentive to take a closer look at alternatives. For people without scales: for 1 teaspoon of baking powder, mix 1/2 teaspoon cream of tartar with 1/4 teaspoon of baking soda and 1/4 teaspoon cornstarch. 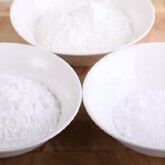 As a rule of thumb for your baking you add 1 gram baking powder to 25 grams of flour used. You have to work quickly after stirring, because this baking powder is a so called single acting or fast acting powder. Baking powder comes in two versions: single acting baking powder, like the one described above, contains acid that dissolves in water. The chemical reaction begins as soon as liquids are added. You have to work quickly to get the most out of this type of powder. I use it in cakes, muffins, scones and cookies and for me it works perfect. 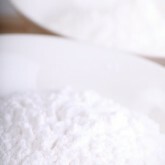 The double acting baking powder, which is the more common commercial version, contains a second acid that only kicks in when it reaches a certain temperature in the oven. If you buy this variety, make sure you get the one that is aluminum free. 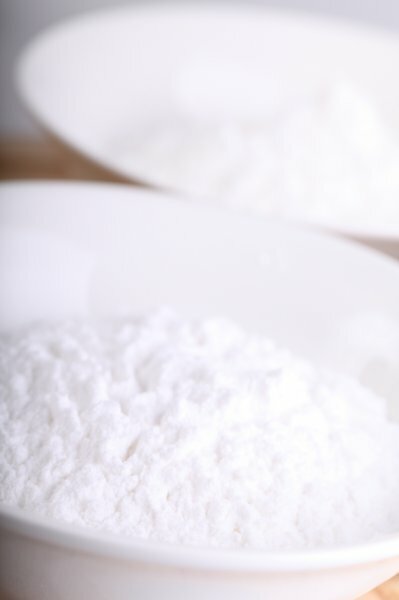 Many recipes call for baking soda rather than baking powder. Usually these recipes use some kind of liquid acid like buttermilk or yogurt to react with the baking soda to produce the bubbles. Baking powder does not last forever! 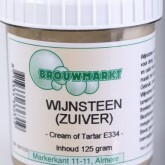 It has a shelf live of 6 to 12 months and it is sensitive to moisture so it is best kept in a cool and dry place. You can test if your baking powder is still active and ready for your baking by pouring some hot water over 1/2 a teaspoon of the powder. If it immediately and enthusiastically starts to bubble you are good to go! i work in an organic bakkery in Utrecht. we make a large volume of scones every morning. They are lovely and fresh but the time it takes to make them every day considerable. I’ve looked into making enough for the whole week and freezing the raw dough. At the moment that isnt possible because, i think the bakpoeder we use is double acting, it reacts to quickly with the wet ingredients. the result is flat, lifeless scones. I was just wondering if you had any suggrstions, from what i understand i need to slow acting bakpoeder? one that reacts only when heat is introduced. Might that be the solution ? We understand your problem in finding a solution for this. 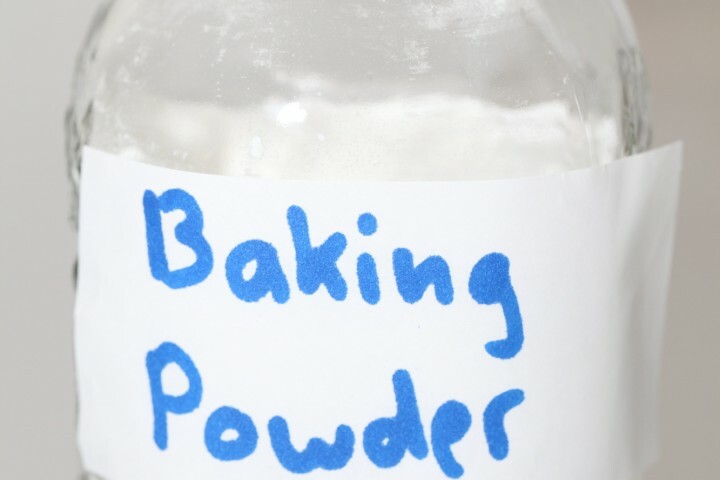 The baking powder we suggest here is single acting but not in the way you are looking for (it gives a chemical reaction and not the temperature reaction you need). Hope you find the perfect way. Good luck with your bakery! Glad you find it useful Fanuel. Very good information. I googelled for a recipe and got to your website. The way you are explaining things is indeed helpful for people like me who have just started baking. I am throwing away all ready to use cake boxes and will rely on good informative website like yours. Many thanks for your input and ideas. Best Regards. Thank you very much for your kind words Shazia! Over the past year we have stopped useing as much processed stuff as we can (not that we used much before) and make as much of our food ourselves. At first I thought why would I make my own baking powder, then I read the piece above and now I know why. You just don’t think that someting so innocuous as Baking Powder would have anything but the basic stuff needed to do the job of a raising agent and I must admitt I just did not think to look at the ingredients (which is funny because I normally do) So I will be useing your home made recipe from now on. I tend to use your site a lot and just when I think I’ve discovered everything a little gem like this pops up. Thanks again. Same over here! Thank you so much for liking what we do. Have fun with making the baking powder. 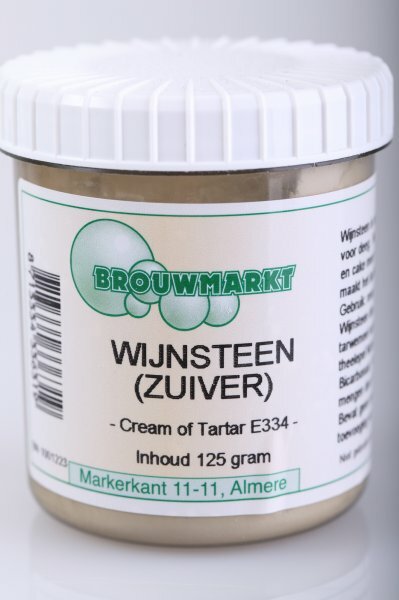 Hi, can you tell me how much baking powder is there i 1Kg. flower, to make my ovn self rising flower? You can find it in the instructions above, on average you need 1 g baking powder for every 25 g flour. So this means that for 1 kilo flour you would need 40 g baking powder. Good luck with it and happy baking and a happy New Year! You can find a lot of information about baking powder and the workings of it in a book called “How baking works’ by Paula Figoni. I understand a bit how it works. 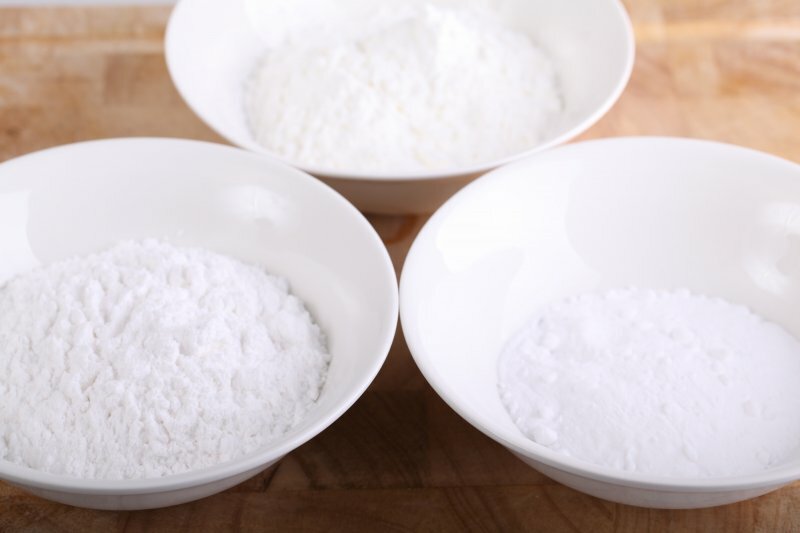 Next to the baking soda you would need an acid that is slow acting or gradually releasing to react in stages with the baking soda to get a good lift during baking and at higher temperatures. The best acid types for this job are either the SAS (sodium aluminum sulfate) or the SAPP (sodium acid pyrophosphate) both best when used in combination with MCP (monocalcium phosphate, which is fast acting) or cream of tartar (also fast acting). I do not like the aluminum for obvious reasons and the SAPP is the one that is described as possibly causing kidney damage plus it has an ‘unpleasant chemical aftertaste’ according to the book. by Mrs. Figoni. Next to this I would not know how or where to get SAPP, SAS or MCP, so I will stick to my single action home made stuff I guess, because it works fine for me. Happy (single or double acting 😉 baking! This is very interesting!! Like you, I always like to understand the science behind it (or try to anyway). Any idea how to go about making double acting baking powder? That’s what I use (here in the US). Rumford baking powder is alu-free, btw. Thanks! That is very interesting, I didn’t know you could make it yourself, and I hate using stuff with additives I can’t even pronounce, let alone know what they are. wijnsteen is NOT equal to wijnsteenzuur. Be very careful, these are two completely different chemical molecules see nl.wikipedia.org/wiki/Wijnsteen versus nl.wikipedia.org/wiki/…nsteenzuur for more information. Your welcome :). I feel it helps a lot in baking and cooking to understand a little bit more about the chemistry behind it. I also love to get to the source of things, to find out what things are made of and what you can leave out if you make it yourself. This is sooo interesting. I have never thought I could make my own baking powder.